(Bulgarian Pleven), the chief town of the department of Plevna, Bulgaria; 85 m. N. E. of Sofia, on the Tutchinitza, an affluent of Vid, which flows north into the Danube and off the Sofia-Varna railway (opened in 1899). Pop. (1906) 21,208. A branch line 25 m. long, connects Plevna with Samovit on the Danube, where a port has been formed. After the events of 1877, it was almost entirely forsaken by the Turks and most of the mosques have gone to ruin; but, peopled now mainly by Bulgarians, it has quite recovered its prosperity, and has a large commerce in cattle and wine. Plevna, prior to the Russo-Turkish War of 1877 (see RUSSO- TURKISH WARS) a small and unknown town without fortifications became celebrated throughout the world as the scene of Osman Pasha's victories and his five month's defence of the entrenched camp which he constructed around the town, a defence which upset the Russians' plans and induced them to devote their whole energies to its capture. (See plevenmap for overall view from Encyclopedia Britannica map. Osman Pasha left Widin on the 13th of July with a column consisting of 19 battalions, 6 squadrons and 9 batteries, a total of 12,000 men and 54 guns. Hearing that he was too late to relieve Nikopol, he pushed on to Plevna. where there was a garrison of 3 battalions and 4 guns, under Atouf Pasha. 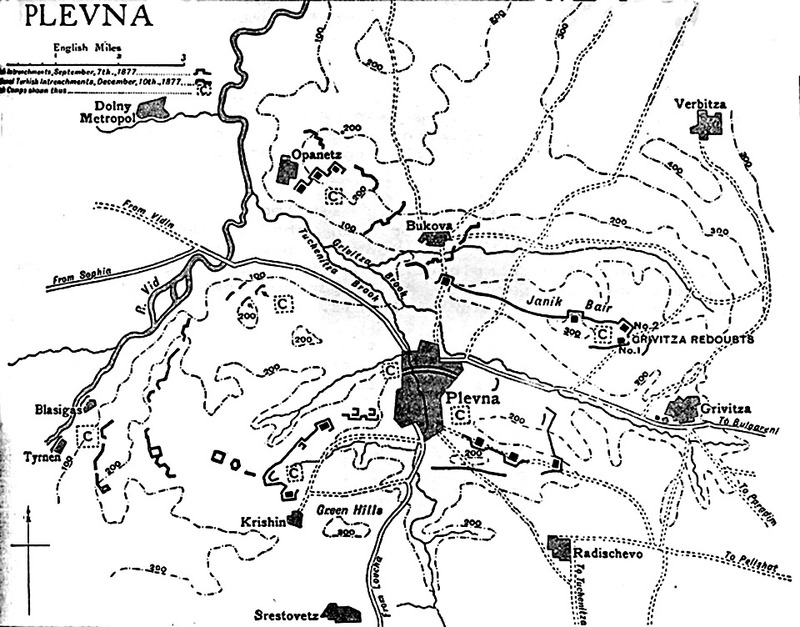 Passing through Plevna on the afternoon of the 19th of July he at once took up a position, previously selected by Pasha, on the hills covering the town to the north and east. The column had been joined en route by 3 battalions from the banks of the Danube, so that Osman's command now consisted of 25 battalions. He was none too soon. General Schilder Schuldner, commanding the 5th division of the IX. corps, which had just captured Nikopol, had been ordered to occupy Plevna, and his guns were already in action. The Turkish batteries came into action as soon as they arrived and returned the fire. A desultory artillery duel was carried on till nightfall, but no attack was made by the Russians on the 19th. Osman distributed his troops in three sections: on the Janik Bair, facing north, were 13 battalions and 4 batteries, with advanced posts of 2 battalions and 1 battery each, at Opanetz and Bukova, facing east and northeast, 5 battalions and 10 guns were posted on the eastern end of the Janik Bair; to the hills south of the Bulgareni road 4 battalions and 2 batteries were allotted, and on either side of the road, under cover, in rear of them, most of the cavalry was placed. The remaining troops formed a general reserve, which was posted on the hill just east of the town. The hills to the north and east of Plevna were perfectly bare. The Turks had covered the 115 m. from Widin in seven days, in trying heat and were exhausted, but a few trenches were thrown up. On the 20th of July at 5 a.m., having made no preliminary reconnaissance, the Russian commander brought his guns into action, and, after a short bombardment, advanced his infantry in four separate columns. See Plevna1s for map of this action from Beskrovni's atlas of Russian militar history. On the north flank they pressed into Bukova, and also succeeded in driving back the Turkish right wing; but in both cases Turkish reinforcements arrived and with vigorous counter-attacks pressed back the Russians, with the result that by noon they were in full retreat, having lost 2,800 men out of a total of 8,000. The Turks lost 2,000. Osman made no attempt to reap the fruits of his victory by pursuit. He at once drew up plans for the fortification of the position, and the troops were employed night and day constructing redoubts and entrenchments. A plentiful supply of tools and daily convoys of stores reached Plevna from Orchanie, and on the 24th of July Osman's strength was increased by 14 battalions and a battery from Sofia. In order to secure his line of communications, on the 25th of July he sent a force of 6 battalions and 1 battery under Rifaat Pasha to occupy Lovcha (Lovatz), where they entrenched themselves. The Plevna garrison now numbered 20,000 (35 battalions, 8 squadron, 57 guns and 400 mounted irregulars), who were organized in two wings with a general reserve. Adil Pasha commanded the left wing consisting of 12 battalions, 3 batteries and 2 squadrons, and held the ground from the Vid bridge to Grivitza, Hassan Sabri Pasha commanded the right wing, of equal strength, covering from Grivitza to the south. The remainder, as general reserve, was posted on the crest and slopes of the hill east of the town, with one battalion in Plevna itself. The west front was not fortified till October. Trenches were 4 ft. deep and the redoubts had a command of 10 to 16 ft., with parapets about 14 ft. thick. In addition to the trenches to the flanks, there were in some cases two lines of trench to the front, thus giving three tiers of fire. In accordance with orders from the Russian headquarters at Tirnova, a fresh attack was made by General Krudener on the 30th of July. 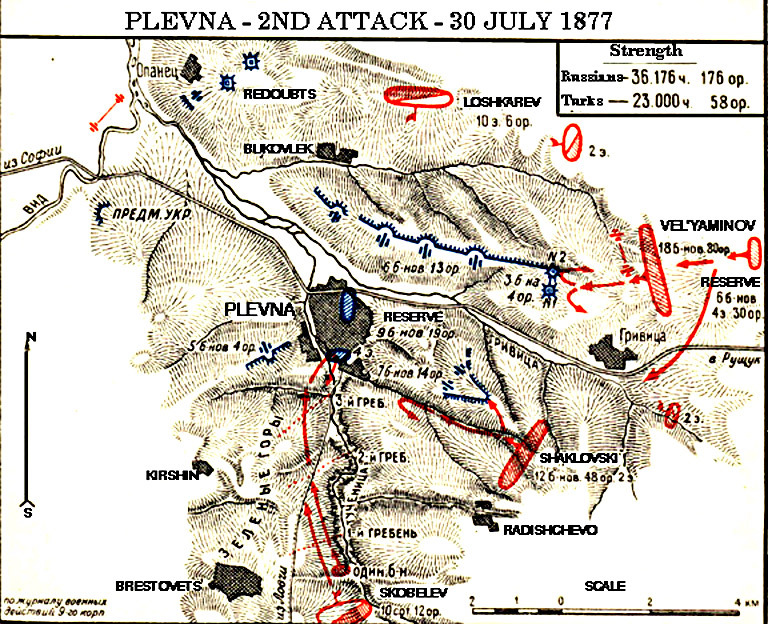 See Plevna2s for map of this action from Beskrovni atlas. He had been reinforced by three brigades of infantry and one of cavalry under General Shakovskoi, and his force numbered over 30,000 with 176 guns. After a preliminary cannonade the infantry advanced at 3 p.m., as before in widely spread columns. The columns attacking from the north and north-east were repulsed with heavy loss. Shakovskoi advancing from Radischevo, his left flank safeguarded by Skobelev from the neighbourhood of Krishin, temporarily occupied two redoubts, but a heavy counter-stroke by the Turkish reserves forced him back with severe loss. The Russians retreated, the northern column to Tristenik and Karagakh, the southern to Poradim. Their losses amounted to 7,300, while the Turkish losses exceeded 2,000. Had the Turkish garrison of Lovcha been called in, the result would have been still more disastrous to the Russians. The victory was decisive, but Osman again failed to pursue. His troops were elated by success, the moral of the enemy severely shaken, the undefended Russian bridge over the Danube was within 40 m. of him, but he lost his opportunity, and contented himself with strengthening his defensive works. It is said that he was tied down to Plevna by orders from Constantinople. 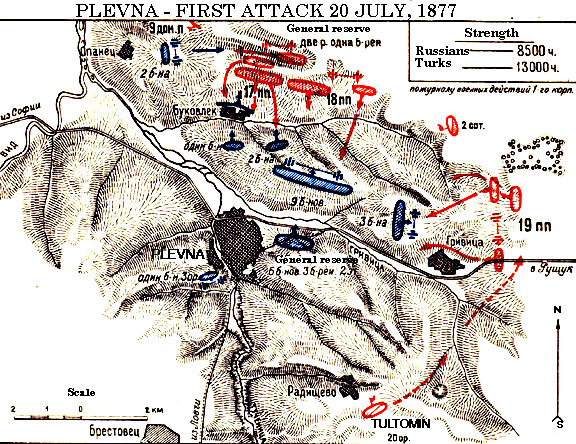 The Russians now concentrated all their available forces against Plevna and called in the aid of the Rumanians. By the end of August they had assembled a force of 74,000 infantry, 10,000 cavalry and 440 guns, including 24 siege guns, about 100,000 men in all. On the 30th of August Osman moved out of Plevna with all his cavalry, 3 batteries of artillery and 19 battalions of infantry, and on the 31st attacked the Russians about Pelishat. He returned to Plevna the same evening. The Turks lost 1,300 and the Russians 1,000 men. 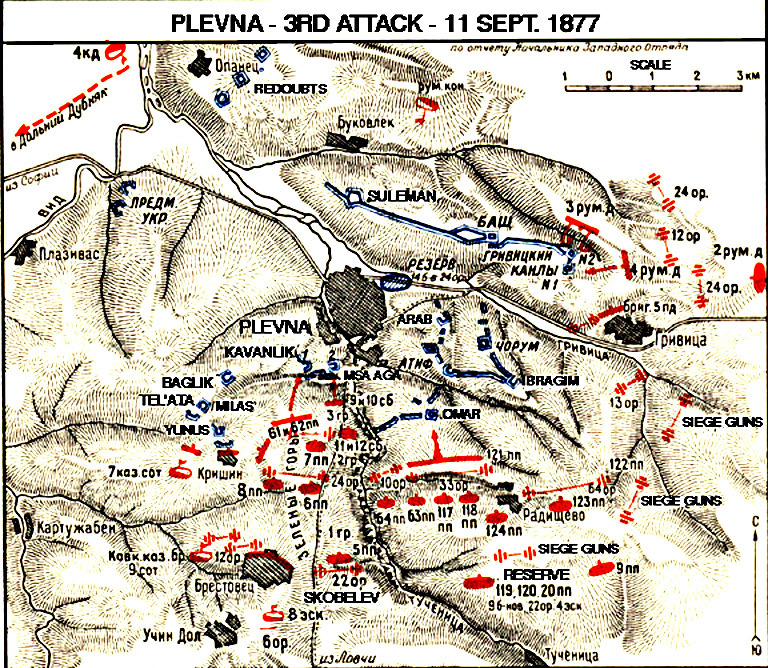 The Russians determined to occupy Lovcha, and so cut Osman's communications before again attacking Plevna. After three days' fighting this was accomplished by Skobelev, acting under Imeretinski, with a force of 20,000 men, on the 3rd of September. Osman moved out to the relief of the garrison that day with a strong column, but, finding he was too late, returned to Plevna on the 6th. The survivors from Lovcha were reformed into 3 battalions, including which Osman had been reinforced by 13 battalions, 2.5 batteries of artillery and 11 squadrons of cavalry. His strength was now 30,000, with 72 guns, 46 battalions, 19 squadrons and 12 batteries. This force was organized in 4 approximately equal commands, the northern, south-eastern and southern, and a general reserve. The Russians moved to their preliminary positions on the night of September 6th-7th. Their plan was for the Rumanians, the IX. and IV. corps and Imeretinski's column to attack the north-east, south-east and south fronts simultaneously. An artillery bombardment began at 6 a.m. on the 7th of September, was carried on till 3 p.m. on the 11th, when the infantry advanced. The Rumanians took one Grivitza redoubt. Skobelev occupied two redoubts on the south front, but the centre attack on the Radishevo front failed. On the 12th the Turks recaptured the southern redoubts, the Rumanians remained in possession of the Grivitza redoubt, but the Russian losses already amounted to 18,000 and they withdrew, and entrenched themselves on a line Verbitza-Radishevo, with cavalry on either flank to the Vid. The Turkish losses totaled 5,000, of which only a few hundred were caused by the artillery fire of the first few days. There was no question of pursuit. The Russians were greatly superior in numbers and the Turks were completely exhausted. See Plevna3s for map of this action. Several causes contributed to the Russian defeat. The Russian bombardment, at ranges beyond the powers of their guns and lacking the co-operation of the infantry to give them a target, had been useless. No reconnaissance had been made of the position. The infantry attacks were not simultaneous, and were beaten in detail, besides which, they were spread over the whole of a strongly fortified front in equal strength, instead of being pressed home at definite points. The lack of unity of command, in that the commander-in-chief interfered with the dispositions and conduct of the operations as arranged by the commander of the Plevna forces also militated against the Russian success. This was the last open-force attack on Osman's lines. General Todleben, the defender of Sevastopol, was now entrusted with the conduct of the siege, and he determined to complete the investment, which was accomplished by the 24th of October, Osman's request to retire from Plevna having been refused by Constantinople. Supplies eventually gave out and a sortie on the night of the 9th-l0th. of December failed, with the result that he and his army capitulated. F. V. Greene, The Russian. Army and its Campaign in Turkey (London, 1880); General Kuropatkin (Ger. trans. by Krahmer, Kritische ruckblicke auf den russisch-turkischen Krieg; Mouzaffer Pacha and Talaat Bey, Defense de Plevna; Krahmer's German translation of the Russian Official History; General H. Langlois, Lessons of Two Recent Wars (Eng. trans., War Office, 1910); Th. von Trotha, Kampf um Plewna (Berlin, 1878); Vararesco (Ger. trans. ), Rumaniens Antheil am Kriege, 1877-1878 (Leipzig, 1888). The author, John Henry Verrinder Crowe, Lt Colonel, Royal Artillery was Commandant of the Royal Military College of Canada and previously Chief Instructor in Military Topography and Military History and Tactics at the Royal Military Academy, Woolwich. He was author of Epitome of the Russo-Turkish War, 1877-1878. and the encyclopedia entry on the war. Return to Xenophon. Return to Ruscity. Return to Rushistory. Return to Ukraine. Please leave a note in our guestbook.